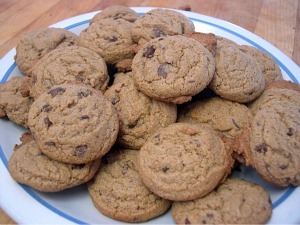 These healthy chocolate chip cookies may not be great for your waistline, they do offer health benefits of lower fat and higher fiber than the not so healthy chocolate chip recipe I used to adapt it. Moist and chewy, they do taste great! Looking for the real thing? Ruby's Best Chocolate Chip Cookie Recipe here! 1. Preheat oven to 375. Line two large baking pans with parchment paper. Set out racks to cool cookies. 2. In a large bowl, combine oil applesauce, sugar, milk and vanilla. Beat at medium speed until well blended and creamy. Beat egg into creamed mixture. 3. Combine flour salt and baking soda and mix into creamed mixture until just blended, do not overmix. Stir in chocolate chips. 4. Using an ice cream scooper, drop balls of cookie dough staggered 2" apart onto a prepared cookie sheet. Usually eight will fit in the pan. 5. Bake one sheet at a time in the preheated oven for 9 minutes just until the edges brown, they will appear to be a little undercooked. 6. Remove from oven, cool for 3 minutes on the cookie sheet, then with a very thin spatula, remove the cookies to the cooling rack to cool completely.